Jigyasa and Pratibha: It is a rare delight to see people wearing their traditional costumes these days. Is this your everyday costume? Mrs Sushil Rathore: When I was married, I was expected to wear this traditional costume. Over time, I became comfortable wearing it and have continued to do so. I wear it to parties as well. Col. Uday Singh Rathore: As Rajputs, we have grown up learning to take pride in our culture, and our attire is a part of that. J&P: When and how did you first meet? She: We met first in June 1978 when it was arranged for us to ‘see’ each other. He was looking for an educated girl and I was looking for a man who would not drink or smoke. We liked each other instantly. After marriage, I had to move to his village. I found it easy to adjust with his family and village life for which my mother-in-law has always remained appreciative. J&P: Did you lead a conservative lifestyle? She: There were restrictions, and one had to work around them. For many years, we followed the purdah system. I did not have permission to work elsewhere, but I was allowed to stitch from home. I found that convenient since I could attend to my household duties and to the children. When my husband was posted in other places, I undertook needlework, tuitions and also taught women to sew. I now manage my own honey business. J&P: Tell us about your background? She: I am from Jhunjhunu and graduated from Sophia College in Ajmer. Because of his postings, we have lived all over India. 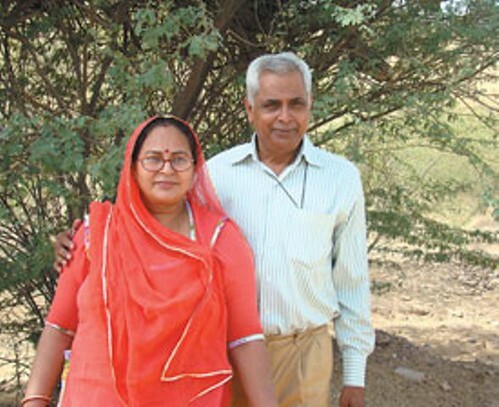 He was first posted in Jodhpur from 1980 to 82 and again from 2006 onwards. After our marriage, we stayed in Ladakh for three months, and later were posted in other places – Jodhpur, Delhi, Jabalpur, Guwahati, Shillong, Ambala, Tamil Nadu. We have two sons who are married. He: I was born in Chordia village of Rajasthan, but most of my childhood and youth was spent in Jodhpur. With a degree in History, I did a post-graduation in IT and an MBA in Human Resource Management. J&P: How did you make such clear choices? He: My mentor and guide was Major Sultan Singh (IPS) who was the DGP of Rajasthan Police. I lived in his house for 17 years, along with 25 other cousins and friends of my age. He was a role model for all of us and brought us up since we did not have the opportunity to get educated in our own village. It was from him that I derived my understanding of life that if one wanted to succeed, one must learn the art of people management. J&P: What was it that drew you to each other? Is there any change you would like to see in the other? She: The moment I saw him, I said to myself, “He is the man for me.” There is nothing in him that I would ever want to change; he is perfect. But yes, I used to tell him not to let others take him for granted. If you wish to help someone, you should offer support instead of allowing them to depend on you completely. Over time, I have seen him agree to this point. In fact, he always listens to what I have to say. J&P: Any advice on how one must choose one’s life partner? He: No one is perfect. We are a mixture of good and bad, strength and weakness, ideals and challenges! What is important is sharing similar life values. When my younger son brought home the girl he wanted to marry, I asked her to write a page on the 18.43 verse of the Gita which describes the qualities of a Kshatriya. And when she did, nothing else mattered! She: When a marriage takes place, it is not just a relationship between two people, but between their families. Even if one is initially drawn to wealth and status, what will sustain is a strong bond between the two families. Each one must accept and respect the other’s family. I am not impressed with wealth or cars or a dazzling lifestyle. Education is the real wealth. J&P: What brings about the kind of inner discipline that you seem to display? He: A sense of purpose. I try to live a simple life according to the wisdom of the Bhagavad Gita. This book is my guru since it came into my hands in a very mystical manner. In 2004, while I was ardently searching for a guru, at the temple of Ganesha in Pillayarpatti in Tamil Nadu, a child gave me the Gita asking me to read it. Over the years, I have come to believe that in the Mahabharata going on inside me – with my weaknesses, my strengths, my attachments – the teachings of the Gita can bring about a harmonious synergy within me. J&P: Is there a simple formula? I plan for the next three days, the next three years, and the next three decades. I follow the notion of three and plan in advance. J&P: Decades – that amounts to thinking of life as immortal rather than ephemeral, does it not? He: Not really; I ask myself how I would like to be thirty years from now. The first answer is – Healthy! So that creates an inner discipline. A spontaneous auto-suggestion to the body takes place. J&P: Ah yes, now we can see where your notion of perfection stems from! He: The idea of perfection is connected to the technique of six sigma. It is a management strategy to ensure that one makes minimum mistakes. As you may be aware, the performance of the Mumbai dabbawalas has been graded as one of six sigma. So as an army officer, I was always watching my qualitative performance very closely. It inspired me to give my best to each and every moment. She: That’s him – always working, always watchful of himself. Both of us keep ourselves engaged always. My mother taught me never to be idle. Education and being mindful that our parents sacrificed to give us that education instils that quality in us. She: He has become a strict vegetarian and enjoys eating typical Rajasthani food like gatta and ker-sangri. I enjoy cooking other cuisines that I learnt while living in other states. I like cooking South Indian food also. He: I believe that vegetarian food is very healthy. I have watched people and communities and believe that vegetarianism is good for the mind and memory. I believe in the concept of sattvik foods as explained in the Gita. J&P: You mean – ‘we are what we eat’? He: Oh yes, I believe that we can understand a person in five ways – 1) by the kind of food he eats, 2) shraddha – the kind of deity he prays to, 3) yajna – his attitude in team work, 4) tapasya –his physical energy, physical routine and capacity for work, 5) daan or giving – giving without expecting anything in return. J&P: Fabulous measure of human existence. What is the final goal? He: To be like a gyroscope; to achieve that perfect state of equilibrium! First published in April 2012 in Harmony – the Indian Magazine for Silvers for the column – Soul Food and Soul Mates. Part-2 of this post is the traditional Rajasthani recipe of Gatte Ki Sabzi from the kitchen of Col. Uday Singh & Sushil Rathore – the 10th couple featured in this column.